The revolutionary fervor unleashed across the region in the wake of Tunisia’s revolt on Sunday spread to Oman and Saudi Arabia, two countries in the oil-rich Persian Gulf that had hitherto seemed relatively immune to the turmoil. 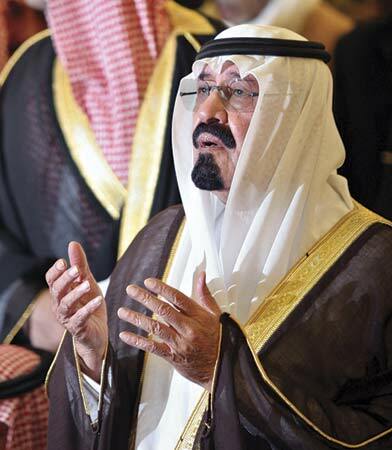 A group of 119 Saudi academics and activists called for the replacement of the current government with a constitutional monarchy that would dramatically reduce the hereditary powers of the royal family, raising the specter of unrest spreading to the world’s largest oil producer. On Twitter and Facebook, activists called for demonstrations on March 11 and 20 to demand reforms, echoing the “Day of Rage” dates set by activists elsewhere. Hundreds of demonstrators clashed with riot police in the northeast port city of Sohar on Sunday, and Oman’s state news agency, ONA, said two protesters demanding political reforms, jobs and higher wages were killed after the governor’s residence, a police station, houses and cars were set on fire. Shortly after the violence, Sultan Qaboos bin Said, who has led oil-rich Oman for the past 40 years, gave orders to create 50,000 jobs and payments of $386 a month to every job seeker. 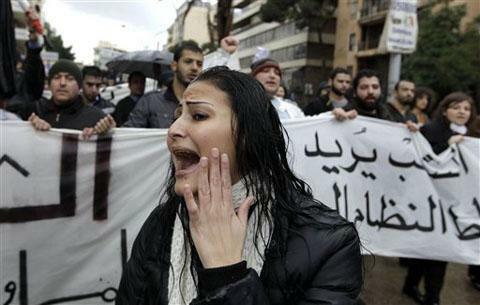 Hundreds of people protested in Lebanon Sunday against the country’s sectarian political system. The protesters in Beirut carried signs and chanted slogans calling for a secular government. Lebanon’s power-sharing system requires that the president be a Maronite Christian, the prime minister a Sunni Muslim and the parliament speaker a Shi’ite Muslim. Each religious group makes up about one-third of Lebanon’s population. The system is unlike many Arab countries where authoritarian regimes have ruled for decades. But the protest appeared to be inspired by the wave of uprisings across the Middle East. Protesters used the social networking website Facebook to help organize the event. RIYADH, Saudi Arabia — In the fraught divide between Sunni and Shia Muslims of the Arab world, the tiny island state of Bahrain is the next crucible of combat. 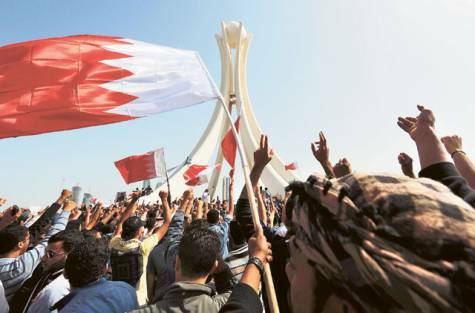 Unprecedented pro-democracy protests there by the Shia community have had a longer reach than what would normally be the case in a country of only 738,000 for one simple reason: Bahrain’s close ties to its huge neighbor, Saudi Arabia. The two countries are linked by a 16-mile, multi-lane causeway and by the shared commitment of their Sunni ruling royal families to remain in power. Oil-rich Riyadh also financially supports petroleum-poor Bahrain. Yet the prominent Scottsdale, Ariz., doctor is the face of American Islam for a Capitol Hill moment. Other than members of Congress, Jasser is the only witness New York Rep. Peter T. King has identified so far forhis upcoming hearings on the radicalization of U.S. Muslims. King, the Long Island Republican who chairs the House Homeland Security Committee, has called the hearings to start March 9. Although he initially spoke out to promote them, his decision in recent weeks to lie low (he declined to comment for this article) and to keep the witness list and precise questions quiet reflects the complexities of debating the problem, experts say. As representatives of the newly founded “White Group” we urgently address you. Since last Thursday, the 17th of February, the situation in Suleimaniyah city and Governorate is severely deteriorating. After demonstrators protested against the Kurdistan Regional Government (KRG) in a peaceful demonstration, some rallied towards the main branch of the Kurdistan Democratic Party. Militias of this party answered stone throwing with live ammunition, killing four, and injuring more than 150 people, in addition to detaining unknown number of demonstrators. Since then, the situation is heating up. Thousands of heavily armed militiamen were sent into the city; young protesters are enraged. Every day thousands, if not tens of thousands, gather in Suleimaniyah and other cities of the governorate for demonstrations. Normal life came to a standstill. We are trying to calm the situation, standing daily in white clothes between the heavily armed militias and the demonstrators. We could have prevented further violence, but we are not sure for how long we are able to continue. We are severely shocked that until now we didn’t hear any official U.S. statement. Since one week now this situation is unfolding. Any condemnation or even expression or concern from the U.S. would have helped a lot. People here are just demanding their basic rights. 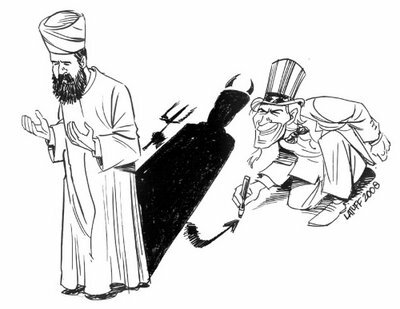 We all thought that the U.S. seriously believes in democracy in Iraq. Now we see you watching how militias not accountable to the government, but [to political] parties, use excessive force against demonstrators. As you can see in these pictures heavily armed soldiers are stationed everywhere in our city. Therefore we strongly urge you to take action. We believe your voice is still heard in Iraq and especially Iraqi-Kurdistan, where U.S. troops were greeted as liberators in 2003, inspiring us to work hard for improving the situation of people here. Please make clear to the responsible politicians and parties that the U.S. will not accept further violence and killings against civilians. Your silence was recognized too. Especially the young demonstrators we talk to on a daily base got the impression the U.S. is not with the people but the parties here. The future of Iraq and Kurdistan lie in the hands of this young generation. The future of bilateral ties with the U.S. too. So it’s high time to take action. We don’t know how long we will be able to keep the situation calm. We need your help now. If it will be too late after Friday, the day of demonstrations all over Iraq and Kurdistan, we all will regret that no steps were taken to prevent harm and more destruction. We are again very afraid that if nothing happens, our city and governorate will soon see a bloodbath. The White Group is composed of various civil society organizations, civil society activists, journalists, and artists. 1. Suing all of those involved in murdering the demonstrators in Suleimaniyah and publicly announcing the court rulings related to this matter. 2. 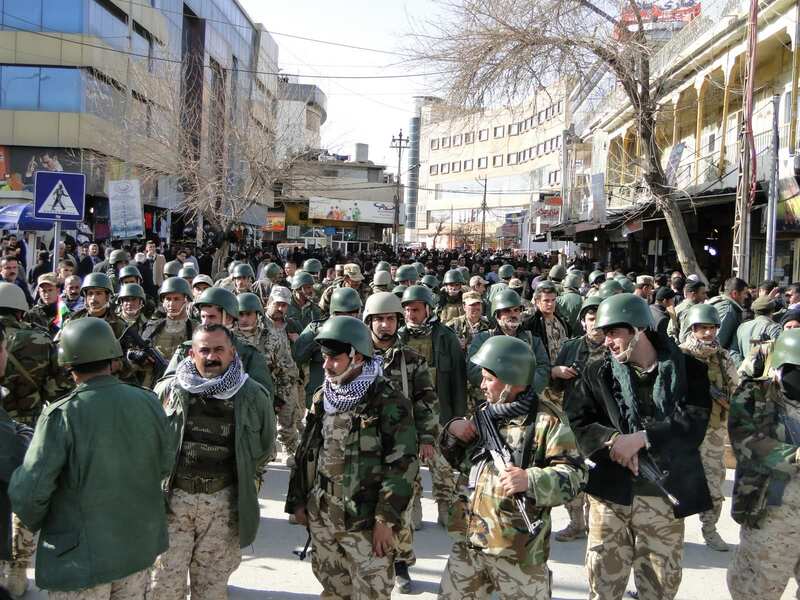 Withdrawing all of the forces brought to Suleimaniyah and keeping only those forces affiliated with the Ministry of Interior in the city. 3. The authorities should promise that force will not be used to face the demands of the demonstrators and that it listen to those demands through creating channels of dialogue and conversion. 4. Urgently issuing a decision by the Parliament of Kurdistan to prohibit the use of military forces in internal affairs and conflicts. 5. The President of the region and the Prime Minister should immediately issue an apology to the victims and the people of Kurdistan. 6. Freeing all of those who have been detained as a consequence of the demonstration on February 17th and the demonstrations followed. CPT’s MISSION: What would happen if Christians devoted the same discipline and sacrifice to nonviolent peacemaking that armies devote to war? Christian Peacemaker Teams (CPT) seeks to enlist the whole church in organized, nonviolent alternatives to war and places teams of trained peacemakers in regions of lethal conflict. Is conflict inevitable? 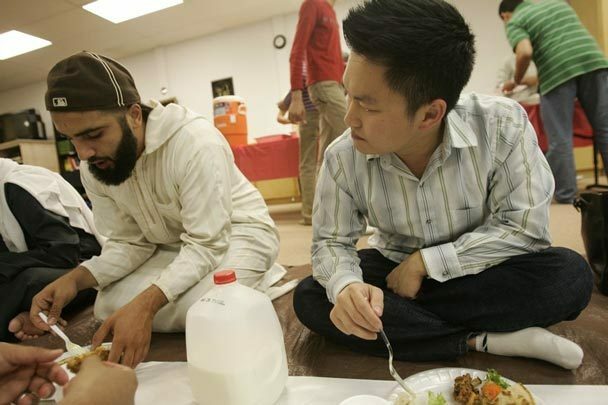 Fighting and fighting words aside, relations between Evangelicals and Muslims are far from uniform. More quietly but no less significantly, Evangelicals and Muslims are seeking sacred flourishing together and collaborating to alleviate human suffering.